I've added all the windows and I've added the fachades on the sides. I've added a road to access to all buildings, and I've resized all buildings to pak64 scale. Very impressive already Looking forward to the finished work. All you pngs are belong to us!! The modeling stage has finished. 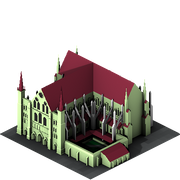 I won't add more details to the fachade, so it's time for textures..but before painting it, here you have a preview of the cathedral in several scales and styles.. Very nice and very gothic. Very nice! Is that a comic stile church (the image right above)? Would there also a edition for 192comic? Yes, although I'm not an expert at comic style so I can send you the graphics sources in case you want to add the final details. Ok, I will send you the files to the mail account that is at you forum profile. Thank you, I've received the mail! I think you will find the cathedral in the next pak192.comic version! 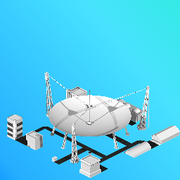 WIP of the Big Ear Radiotelecope. More WIP from Big Ear..this time, some in-game screenshots of the model with textures..looks really good, doesn't it? As an (ex) geologist, I like! Very nice!!! At which time you paint a dino-park with real dinos? Of course animated. The Jurasicc Park is not on my list...yet. 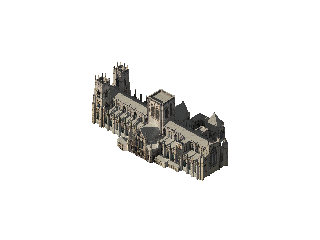 Vilvoh look at my Cathedral, need help to finish it, could you? I need the correct template for it! I would say it's a 3x1. I'll check it this afternoon, but I'm not sure about the scale. It's the Notre-Damme cathedral, isn't it? Oh OK. I think it is possible to export sketchup models into something blender can read though. If you are happy for your model to be used in pak128.Britain (with modifications) and be open-source, I'd be very interested in it once you have finished.